Note that this Hidden Data Role is not available for all Objects and cannot be used as both a Hidden Data Role and Data tip value, it can only be assigned to one role. In this example, we will look at how to use the Hidden Data Role for an External Link. You want to show an index of available assets, and you have a URL to point directly to that asset. Your company sells products, you want to show a table summary of product profit but have a URL that points to each Product’s development page. As the travel department, you want to see individual travel reports rolled up to owner, but have a URL that can link out to each individual report. The applications are endless when applied to our customer needs. One URL is for each Super Bowl event, so I have 52 URLs, one for each row of data. The second URL is for each winning team. There have been 20 unique Super Bowl winning teams, so I have 20 unique URLs. In previous versions of SAS Visual Analytics, if you wanted to link out to one of these URLs, you would have to include it in the visualization like in the List Table shown above. But now, using SAS Visual Analytics 8.2, you can assign a column containing these URLs to the Hidden Data Role and it will be available as an External URL. Here is our target report. We want to be able to link to the Winning Team’s website. 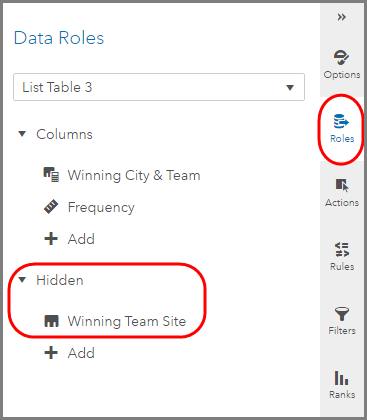 In Visual Analytics 8.2, for the List Table, assign the Winning Team URL column to the Hidden Data Role. Then, for the List Table, create a new URL Link Action. Give the Action a name and leave the URL section blank. This is because my data column contains a fully qualified URL. If you were linking to a destination and only needed to append a name value pair, then you could put in the partial URL and pass the parameter value, but that’s a different example. 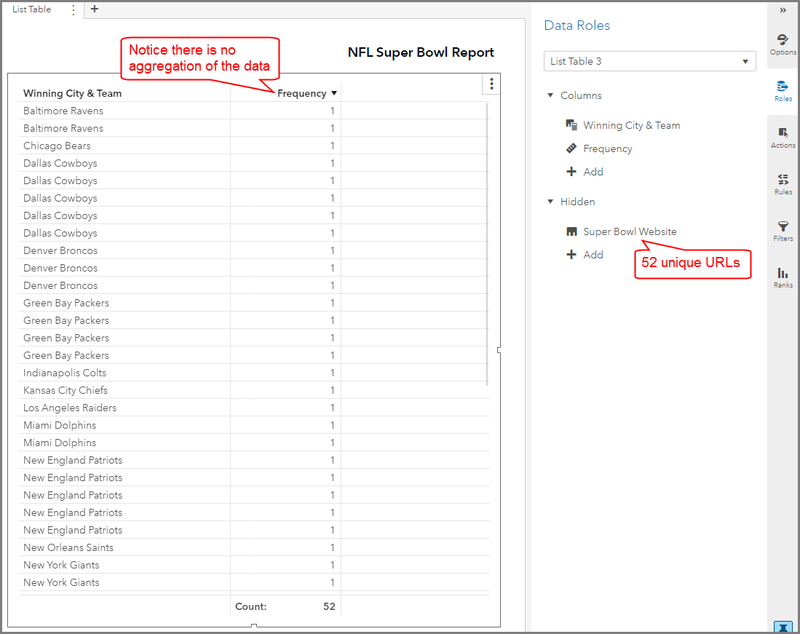 That is using the column which has 20 URLs that matches the winning team in the Hidden Data Role. 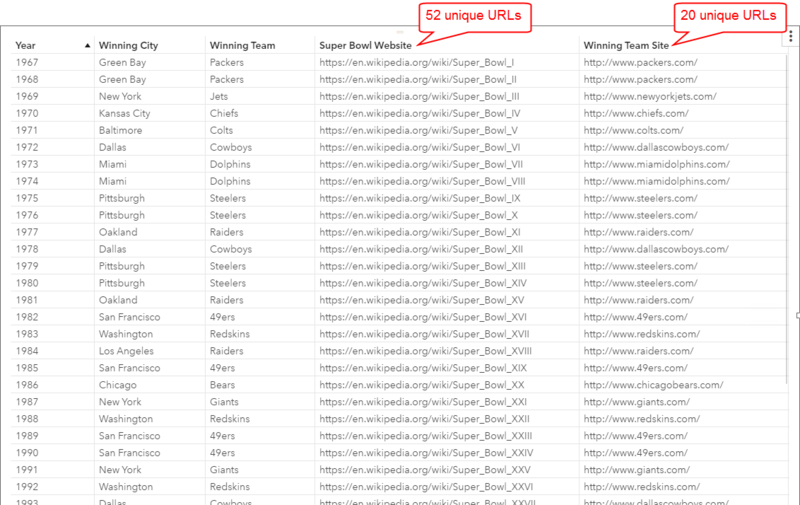 Now, what if we use the column that has the 52 URLs that link out to the individual Super Bowl events? That’s right, the cardinality of the Hidden Data Role item does impact the object. Even though the Hidden data item is not visible on the Object, remember it is included in the results query; and therefore, the cardinality of the Hidden data item impacts the aggregation of the data. Notice that some objects will just present an information warning that a duplicate classification of the data has caused a conflict. 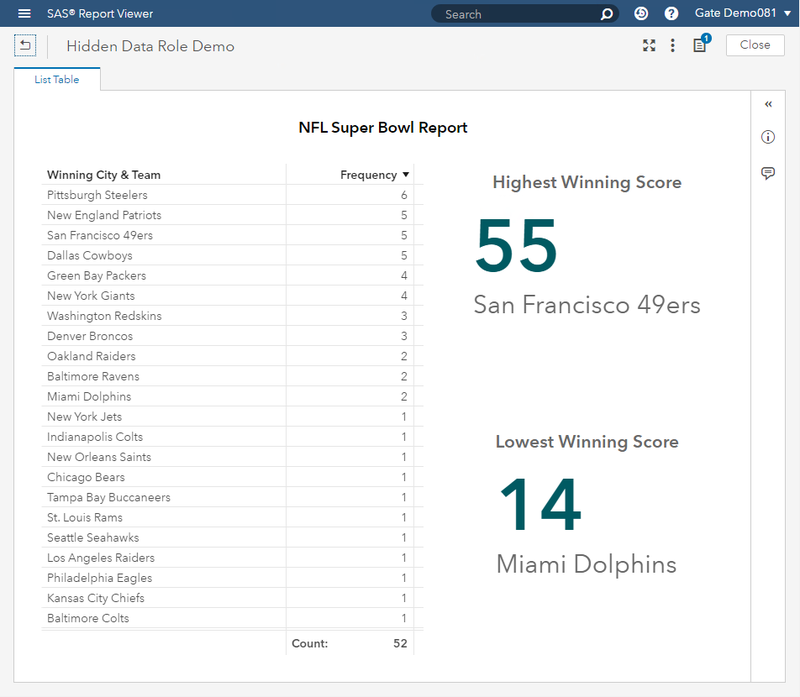 In conclusion, the Hidden Data Role is an exciting addition to the SAS Visual Analytics 8.2 release. I know you'll enjoy and benefit from it. The power behind a Hidden Data Role in SAS Visual Analytics was published on SAS Users.